Hunting Monsters: EU to rescue Iceland? The Guardian reports that Iceland is to be fast-tracked for EU membership, and could become a full member of the European Union by 2011. Iceland's economy tanked last year. In the wake of the economic collapse, many people there reached the conclusion that their country was too small to sail alone through the stormy seas of the world economic crisis. EU membership, previously blocked by the country's political and economic elite, suddenly came to the top of the national agenda. Now, why the EU is so eager to embrace Iceland is not quite so clear. Altruism is, obviously, a lofty motive, but there are many countries in the world (many countries even in Europe, broadly defined) whose struggling economies could be assisted by being allowed to join the EU. 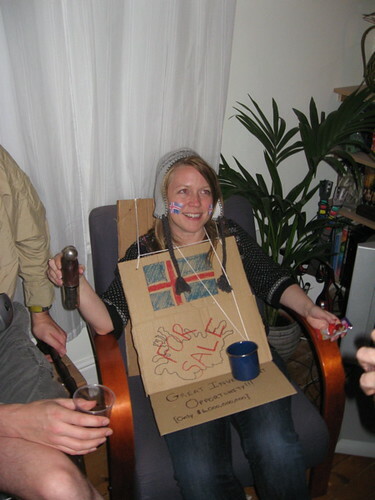 Prioritising Iceland's accession (after a long period in which the country was happy to remain outside the Union) could lead to the EU being seen as some kind of sugar daddy that will step in to rescue countries whose attempts to go it alone do not work out. That said, maybe taking in Iceland in like now would be good for the EU, as it shows potentially wayward members the dangers they could face if they go it alone. That article also suggests that there is more support in Iceland for adopting the Euro than for full membership of the EU. People in the country's fishing industry are fearful of having to share their ever-dwindling country's fish stocks, and there are apparently the usual leftist anti-EU types in Iceland. These might prove strong enough to prevent the country signing up for EU accession. With regards to the Euro, people tend to assume that you have to be in the EU before you can adopt the currency. This is not actually the case. Montenegro adopted the Euro in the 1990s and is still only a candidate for EU membership. I think, though, that the EU does not really approve of non-member states adopting the Euro, and Iceland's adopting the currency now could complicate future accession negotiations.